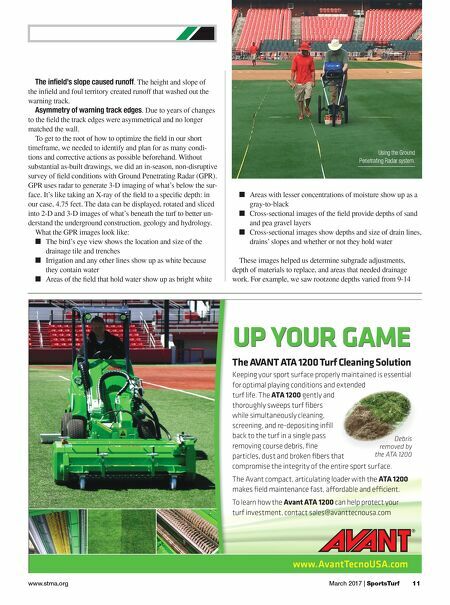 10 SportsTurf | March 2017 www.sportsturfonline.com FIELD SCIENCE When we began fi eld renovation talks with the St. Louis Cardinals, we had our work cut out for us. We were essentially taking the fi eld from "iPhone 4" status to "iPhone 7" capabilities. 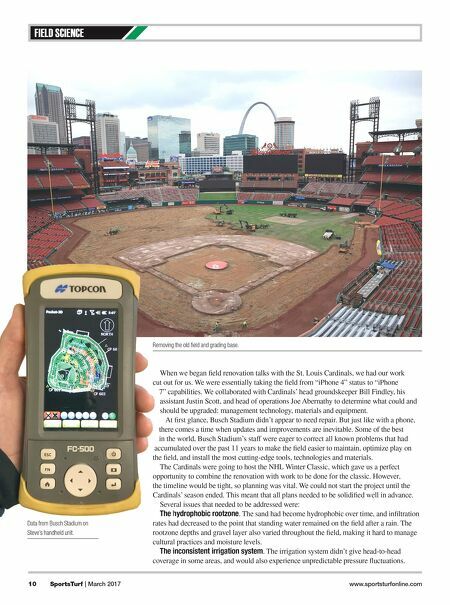 We collaborated with Cardinals' head groundskeeper Bill Findley, his assistant Justin Scott, and head of operations Joe Abernathy to determine what could and should be upgraded: management technology, materials and equipment. At fi rst glance, Busch Stadium didn't appear to need repair. But just like with a phone, there comes a time when updates and improvements are inevitable. Some of the best in the world, Busch Stadium's staff were eager to correct all known problems that had accumulated over the past 11 years to make the fi eld easier to maintain, optimize play on the fi eld, and install the most cutting-edge tools, technologies and materials. The Cardinals were going to host the NHL Winter Classic, which gave us a perfect opportunity to combine the renovation with work to be done for the classic. However, the timeline would be tight, so planning was vital. We could not start the project until the Cardinals' season ended. This meant that all plans needed to be solidifi ed well in advance. Several issues that needed to be addressed were: The hydrophobic rootzone. The sand had become hydrophobic over time, and infi ltration rates had decreased to the point that standing water remained on the fi eld after a rain. The rootzone depths and gravel layer also varied throughout the fi eld, making it hard to manage cultural practices and moisture levels. The inconsistent irrigation system. The irrigation system didn't give head-to-head coverage in some areas, and would also experience unpredictable pressure fl uctuations. When we began fi eld renovation talks with the St. Louis Cardinals, we had our work cut out for us. We were essentially taking the fi eld from "iPhone 4" status to "iPhone 7" capabilities. We collaborated with Cardinals' head groundskeeper Bill Findley, his assistant Justin Scott, and head of operations Joe Abernathy to determine what could and should be upgraded: management technology, materials and equipment. At fi rst glance, Busch Stadium didn't appear to need repair. But just like with a phone, there comes a time when updates and improvements are inevitable. Some of the best in the world, Busch Stadium's staff were eager to correct all known problems that had accumulated over the past 11 years to make the fi eld easier to maintain, optimize play on the fi eld, and install the most cutting-edge tools, technologies and materials. The Cardinals were going to host the NHL Winter Classic, which gave us a perfect opportunity to combine the renovation with work to be done for the classic. However, the timeline would be tight, so planning was vital. We could not start the project until the Cardinals' season ended. This meant that all plans needed to be solidifi ed well in advance. Several issues that needed to be addressed were: The hydrophobic rootzone Removing the old field and grading base. Data from Busch Stadium on Steve's handheld unit.